The primary function of this position is to provide daily cleaning of indoor and outdoor animal exhibits, and prepare and distribute baboon diets. This position reports directly to the Animal Care Supervisor. Working with another specialist, this position is responsible for cleaning and sanitizing baboon housing and support areas (kitchen, equipment, produce cooler, break room, storage areas, feed storage, and related areas); preparing and providing baboon diets; reporting unusual behavior or injuries; and maintaining pertinent records. There may be opportunities for individual projects based on level of education, time worked and experience as well as other opportunities for growth and development. 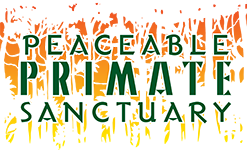 This individual will be expected to work closely with other members of the sanctuary staff, to ensure the overall health and welfare of the animals. Entry level requires a high school diploma or equivalent. Must be able to work in a small team environment, read and follow written and verbal instructions and write legibly and accurately. No prior animal experience required, but must have aptitude for the care and wellbeing of animals. Experience with animals, including nonhuman primates, preferred. Proof of a negative TB test and Tetanus vaccination is required. Must be over 18 to apply. Internship Description: PPS will provide a unique opportunity for individuals interested in the behavioral or biological sciences to learn and participate in the care of captive baboons in a sanctuary environment. This internship is designed for those individuals wishing to gain experience with baboons and will focus on their basic needs such as diet, sanitation, socialization, enrichment, and security. Through the experience, interns will gain knowledge of baboon behavior and animal care. Qualifications/Experience: Please send unofficial transcripts, two letters of recommendation, resume and a cover letter, which details your interests, dates you are available and any other qualifications. Both undergraduate and graduate students are encouraged to apply. A general understanding and concern for the well being of animals is required. Coursework in primatology, biology, or animal behavior is preferred but not required. Proof of a negative TB test and Tetanus vaccination is recommended. Must be over 18 to apply. Salary/funding: The internship is on a volunteer basis and provides no stipend. Internship Term: Full time, 40 hours per week, available time frames throughout the year. Please request time frame in cover letter. Minimum eight-week commitment.